Fact #1:I love to read. Over the past year specifically, there are some books that I’ve shared with as many friends as would let me. Although it’s not the “New Year” so much anymore- I still wanted to share this list with you! Especially if you are longing to cultivate stillness into your everyday life or embrace the everyday mess you find yourself in(moms!) these are for you! I find myself texting my friends images of books with the text “you need to read this!” (because of course they want to). ;) Below are those very same books- so no worries, if we’re not real life friends yet… you won’t miss out! I’ve compiled them into two short and sweet lists. Group one: The beauty of rest, stillness, humility, and spirituality in the everyday life. Group two: Gospel-focused motherhood. Because, let’s be honest…that’s the good chunk of my life right now! So without further ado… check them out! Celebration of Discipline by Richard Foster- I would suggest this book to almost every christian I know if I could. It’s all about posturing our lives towards Christ through spiritual disciplines not for religious sake, but for relationship with Him. He brings back historical disciplines the church has practiced throughout history and puts them in a modern context. Each chapter focuses on a discipline and he does a fantastic job explaining the beauty and strength and possible pitfalls of each one. I’ve read through it again and again and led a small group through it. It was incredibly powerful doing it together and practicing each discipline as we read through it. The Rest of God by Mark Buchanan - This isn’t the easiest read but the content really challenged my view on rest and sabbath and convicted me of how half-heartedly we had been practicing it. It really shifted my perspective to see rest in a new light. For anyone struggling to actually rest - you should check this out. Liturgy of the Ordinary by Tish Harrison Warren - Down to earth, easy read with relatable pictures into her everyday life as a woman, mom and wife and her attempts to practice even the smallest of things as liturgy, as an act of worship (including those peanut butter and jelly sandwiches) and seeing how our everyday lives are the perfect opportunity for our faith and character to be continually worked out. Parenting by Paul David Tripp - SO much wisdom and thought behind the WHY of parenting. It’s definitely not a “how to” but a heart check. It’s a great book to bring vision and perspective to your parenting. It’s an encouraging resource that I continue to glean from. 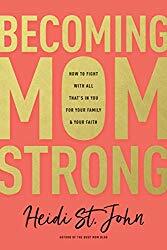 Becoming MOM Strong by Heidi St. John- It felt like I was sitting down to have coffee with a friend. Easy read with an obvious Gospel focus from a mom of SEVEN who gets it. She’s been there- she knows the ups and downs and the crazy emotions. I felt seen and challenged. I walked away with a renewed sense of the absolute irreplaceable role I play in my kids lives, knowing that God chose me for this role and a fresh conviction that I can’t approach motherhood passively. Raising Grateful Kids in an Entitled World by Kristen Welch - I devoured this book and found both encouragement and practical ideas of how to be intentional with my children in cultivating gratitude. The author’s stories were relatable and I greatly appreciated them. I walked away knowing that can’t raise grateful kids if I model anything different than a grateful life myself. P.S. The above books are all in my home, used and slightly tattered from thumbing through the pages. Affiliate links used where appropriate - this means I make a teeny tiny percentage off purchases made through these links. You pay the same as you would any other way!